An Easy Guide - What is the Web Browser Cache? The Web Browser Cache also commonly known as Temporary Internet Files is a location (Folder) on your computer Hard Drive used to store information from any visited websites. Put simply, Caching is effectively a storage facility for website content. Every time you visit a website for the first time information is stored on your computer hard drive allowing your computer web browser to load web pages much faster the next time you visit. Please note: Passwords are only stored as part of the caching process with your approval. The Clash of the Cache - Why deleting your Browser Cache is important. The answer is Maintenance. Maintenance is an essential part to everyday living and this is no exception for the Internet. The majority of websites are updated on a regular basis and chance says important information, source codes and image libraries are changing with this. Regular page updates can cause clashes in data stored on your hard drive and with the data stored on the website server. 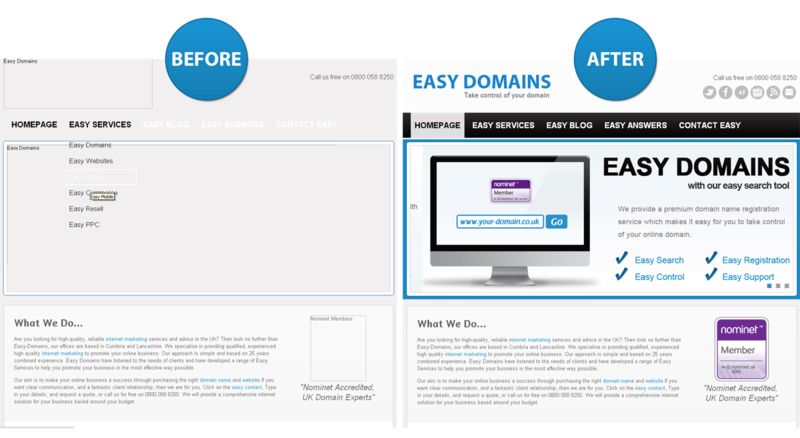 We have provided an example of a clash using our Easy Domains Website below. How do you clear your cache? You should now be presented with a pop up box or window asking that you delete your Browser Cache or Temporary Internet Files.